Forrester Research recently released findings from a survey of US & European adults that was designed to measure their trust in different types of online advertising and promotion. Mirroring the results of a similar study last year, consumers indicated that they trust reviews and recommendations above any other type of advertising or promotion. Especially for businesses with local or regional footprints, this data is added proof that the online ecosystem of reviews and recommendations is not going away and shouldn’t be ignored. The survey of almost 60,000 US online adults conducted in Q1 and Q2 of 2012 focused on different types of web-based advertising and promotion including brand or product recommendations, online reviews, search results, direct emails, social media activities, and display ads (the full list is in the chart below). 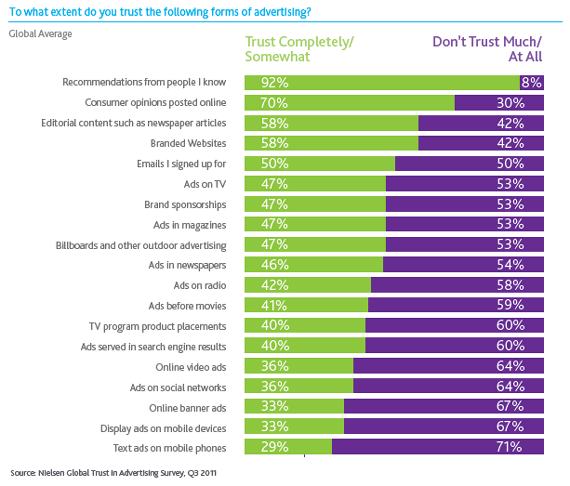 70% respondents reported high levels of trust of brand or product recommendations compared with less than 20% for emails from companies (18%), posts by companies or brands on social sites (15%), mobile app information (12%), ads on websites (10%), or text messages from companies (9%). This illustrates shifts in consumer preference from “push” advertising – where messages are pushed out from brands – to “pull” advertising where the consumers themselves decide what information they’d like to take into consideration in purchasing decisions. The results of this Forrester Study are also in line with similar research last year from Nielson which found that globally, online recommendations were the second most trusted source of brand information only behind first-person recommendations of friends and family. The Nielson study went beyond web-only forms of advertising and promotion and still consumer opinions posted online had close to the highest levels of trust. For brands, especially local or regional businesses, this represents a huge opportunity to maximize their advertising and promotional budgets. This doesn’t mean they should abandon all other forms of advertising and promotion – but monitoring their reviews, keeping tabs on customer sentiment, and responding appropriately to recommendations and reviews can have huge returns relative to the amount of effort required. No longer on the fringes of consumer culture, sites like Yelp, Citysearch, and Google+’s local pages are increasingly becoming the most trusted sources of information for current and prospective customers and as long as truthful reviews accurately portray a business on the web, this trend will continue. Transitioning some of the time and effort that has gone toward more traditional forms of advertising to the monitoring and maintenance of reviews and recommendations may pay dividends in the future. 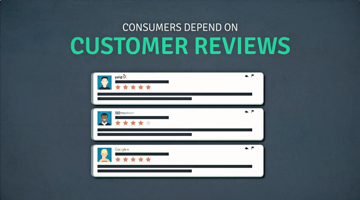 With more and more sites capturing consumer reviews, monitoring all of them can be a daunting prospect for small businesses or those with many locations. However, tools exist to help streamline that process – sites like ours help business owners monitor multiple review sites for multiple business locations. 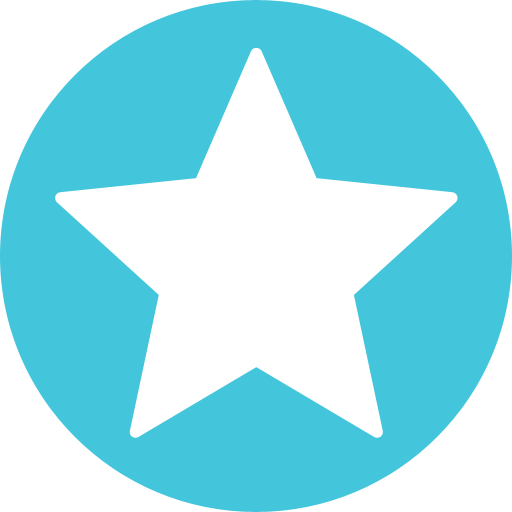 We’re here to help – please contact us if you’re interested in a more methodical way of tackling this increasingly important aspect of your business. 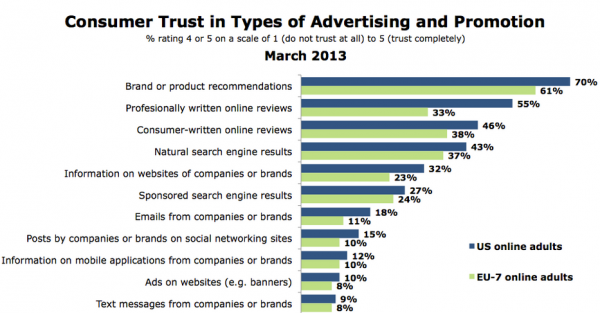 For more information about how the Forrester Research survey was conducted, please visit http://www.marketingcharts.com/wp/interactive/few-consumers-trust-social-media-marketing-internet-ads-28061/. For more information about the Nielson survey, please visit http://www.nielsen.com/us/en/newswire/2012/consumer-trust-in-online-social-and-mobile-advertising-grows.html.